The pace of renovations is too low. Renovation costs are too high. Properties not renovated to nZEB standard will continue emitting CO2, and reduce the time frame for a large uptake of deep retrofits. So, the targets of the Climate Agreement to achieve near zero energy (nZEB) for all buildings by 2050 will not be attained if we continue with current means. Mass uptake of home renovations towards energy-neutral in the NSR is needed to meet EU energy and climate targets. The building sector in Europe is not creating the necessary production facilities. INDU-ZERO’s solution is to design a factory blueprint, based on Smart Industry and Circular Economy, with capacity to manufacture renovation packages suitable for all NSR countries, at a high volume (15.000 renovation packages/factory/year) and at 50% lower cost. 1. Redesigning and adapting existing renovation technology for next-generation Industry4 manufacturing. 2. Upscaling of renovation manufacturing such that the pace goes up and the costs go down. 3. Developing a blueprint for Smart Renovation Factory to manufacture the renovation packages. The blueprint will be available to all factory developers. The renovation packages will consist of an external insulated envelope, heat-recovery ventilation, renewable energy generation, and all will be recyclable (circular). The Smart Renovation Factory will have production capacity 15,000 house renovation packages per annum, and will achieve 50% reduction of renovation costs compared to current methods. The NSR economies and building sector will be boosted by opening a market for deep retrofit renovation packages worth €880 billion. Commitment to develop Smart Renovation Factories will be needed from industry, in some cases in joint ventures with building owner groups and others, in order to achieve these goals. A high degree of public purpose lies behind the Climate Agreement, with strong commitment from governments to achieve the targets. Achievement of sustainable and energy self-sufficient houses in NSR countries that will meet the targets of the Climate Agreement. Mass uptake of home renovations towards energy-neutral in the NSR need to meet EU energy and climate objectives. The building sector in Europe is not creating the necessary production facilities. 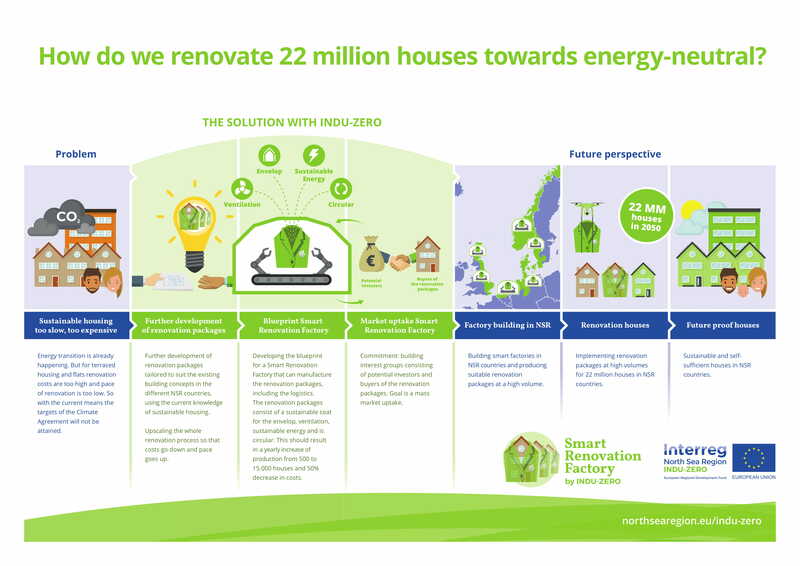 The INDU-ZERO solution for this is to develop a blueprint for a production facility, based on Smart Industry and Circular Economy, that can produce NSR wide suitable renovation packages at a high volume (15.000 units/year) at low cost (50% of current price). This blueprint and the project adoption activities together, will lead investors and governments to commence the needed factory development. This and the 50% cost reduction in renovation packages will lead to a mass market uptake of home renovation packages towards energy-neutral and will ultimately reduce the environmental footprint of the NSR significantly and meet the EU energy and climate objectives. The NSR building sector will be boosted by opening the market for deep retrofit renovation packages worth €880 billion. The consortium consists of industry, government and knowledge institutes. This transnational collaboration is needed to combine all necessary knowledge/experience and to guarantee adoption of the project results.